Life does not stand still. In fact at age 75, I can assure you that it speeds up. After a trip to Africa to experience Kilimanjaro under Berg Adventures International, I started looking for another challenge. Since Kilimanjaro, there have been some lessor challenges, most of them mountains here and there. Perhaps the biggest mountain I have had to climb was a diagnosis of severe coronary artery disease involving a 90% blockage of two major coronary arteries. Dr. Wayne Tymchuk of the Mazankowski Heart Institute in Alberta, Canada guided me to a successful summit of this mountain. In any case, I knew that if I wanted to sign up for the rigours of a high altitude climb, I would have to get clearance from this top notch cardiologist. He did the appropriate tests and graciously supplied me with a letter giving me the go-ahead for another high altitude climb. Since having a very positive experience with BAI, I looked at Aconcagua as my first choice, just one of a multitude of trips BAI offers around the world. 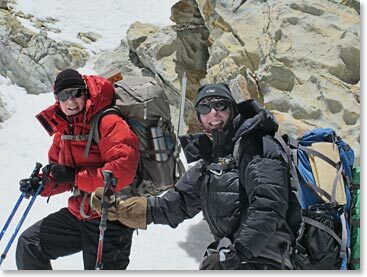 Aconcagua is the highest peak anywhere except for Asia where the Himalayan mountains are. After Wally was good enough to talk to my wife to somewhat ease her fears, I signed up for this climb. I was somewhat fit but increased my physical activities to include running, stair climbing and more walking. Just before leaving for the trip I backed off a bit on this fitness routine because I could not seem to get my weight above 130 pounds. After arriving in Mendoza, the wine capitol of Argentina, I was met by Osvaldo of Bolivia, our guide for the climb. 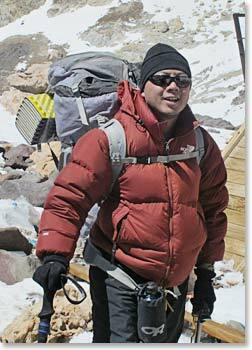 Soon thereafter, at the Hyatt Hotel, I quickly settled in and met the other five climbers for an orientation session. It soon became evident that we were a very compatible group. The next couple of days there were a lot of things to deal with like changing dollers into pesos, topping up the gear that we needed and getting permits to climb this jewel of a mountain. 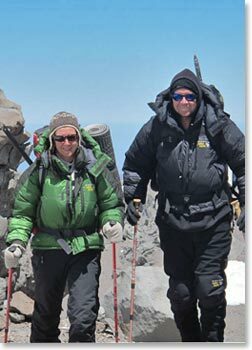 It did not take long to start the acclimatization process as we packed our gear and headed for Penitentes (el. 8500ft/2,590m), a ski resort area. We spent two nights there. My roommate, Winston, whom I called my honorary son, and I hiked up to about 10,000ft/3,050m to help our acclimatization. 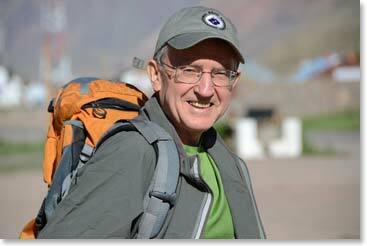 Wally Berg took us all by van to the Chilean border so we could experience an altitude above 12,000ft/3,657m. A lot of switchbacks in the road were encountered on this trip. The road was not to the liking of at least one young mother in tears beside a parked car pointing her husband towards the bottom of the trail. 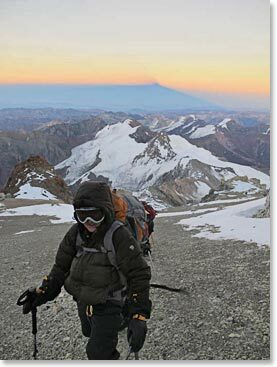 On Jan 18, the time had come to head up the Aconcagua trail. A good look at the recognizable south face of this collossal mountain greeted us as we started at about 9,600ft/2,926m elevation up the beautiful Horcones Valley towards Confluenza (el 11,220ft/3,420m) about 6 miles/10km away. The next day from here we did a trip towards Plaza Francia up to 12,890ft/3,930m to a point where there was again a great view of Aconcagua’s south face. All along the way Wally checked our oxygen saturation levels which invariably were lower than normal but in a good range. After a couple of nights at Confluenza we made our way about 12 miles/19km up the trail to Plaza de Mulas (elevation 14,400ft/4,390m) which would be our base camp. Along the way we took short side trips to enjoy the majestic Andes mountains all around us. At any time in the moutains some unusual event may occur. At the resting place along this trail there was a man bare from the waist up trying to do a head stand on top of a huge boulder. Was the thin mountain air too much for him? Plaza de Mulas would be our base camp and soon we settled in. A medical check-up is mandatory for all climbers who plan to continue from here. Veronica, a very good doctor, spent a bit more time with me due to my history and she was sure to warn me of the risks of the climb. We spent four nights here with good meals, acclimatization excursions and lots of stories from Wally Berg. We never seemed to run out of questions and he never ran out of answers. Osvaldo and Sergio, our guides, and Maria, our cook, attended to our every need and they would really be put to work as we travelled to Camp Canada (e.16,600ft/5,060m). From Plaza De Mulas and on higher camps we had a foretaste of the Aconcagua winds. I do not think I ever saw the Argentinian flag hang limp. The horizontal position seemed to be the norm and the flag ends were often frayed . The tents shook, vibrated and flapped during the nights. My double lined mountain boots first got a work out on the way to Camp Canada. On this carry to Camp Canada my admiration for Osvaldo, Sergio and Maria grew as I saw them carry massive loads, plus some of my own gear, to this and the higher camps. Throughout this trip it was common to talk to people from all over the world some of them coming down the mountain having summitted or failing to summit and some on the way up, like us, aspiring to summit. From this point and higher we could expect it to get windier and colder but during the day when the sun beat down on our tents it was cosy enough for short sleeves. We got the orientation to the “wag bags” used to collect our solid wastes. They are a great idea and greatly enhanced the enjoyment of our surroundings at the high camps. Wally quipped that if your back side is too big for the bag you really do not belong on the mountain. While they are easy to use, imagine trying to use the bag with a freezing, blowing gale up your bare backside! 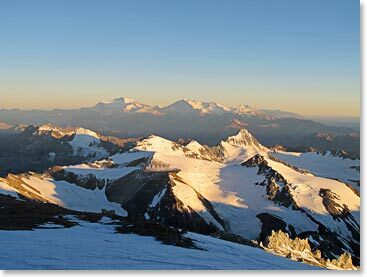 Two nights were spent at Camp Canada and then we moved up to Nido de Condores (e.18,300ft/5,578m), the Condor’s Nest. Patches of snow were encountered on our acclimatization climb and on our final trip to this spot. I was hoping to see the magnificent Andean Condor, but none were seen. We became more and more interested in the weather forecast which was continuously not to our liking. As we looked towards the summit, plumes of snow could often be seen mixed with the blue sky above. This indicated strong winds at the top. 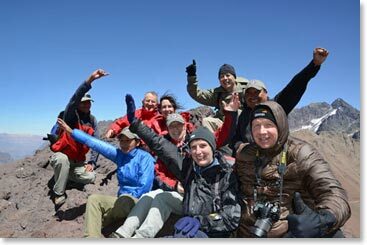 After our first night at Nido de Condores, we did one more accllimatization trip towards Camp Berlin, our highest camp. The decision was made. We would go to Camp Berlin, get settled in and get up at 3:30 AM to make our bid for the summit. The winds seemed favourable enough though not ideal. Getting up in a cold dark tent early in the morning is not great fun, but with the excitement of trying to summit the blood starts boiling. It is vital to dress properly for all eventualities, so this took a bit of time. We dressed in layered clothing, balaclava, touque, ski glasses, mountaineering boots, and ice crampons. We set off in the dark at 5:00 AM with head lamps ablaze. The start of the trail was steep, but the going was okay for a while. Soon the wind picked up drastically. One of our group called it enough and Sergio led him back to camp. I started to fall behind the pace. The wind was now howling and it soon sapped my strength just preventing myself from being blown over. Some of us were blown over. Plate sized chunks of snow were blowing by me. Finally I used my ice axe to pound into the snow to help pull me up the mountain. Osvaldo saw my difficulty and came down to help me catch up with the rest of the group. Somehow with my limited energy and his tremendous strength, we caught up to the rest of the team. Soon after, Wally announced that we needed to head back to camp Berlin. “The winds will only get worse from here on up. No one will summit today,” he said. There were no dissenters in our group and we certainly respected his decision. We had reached 20,840 ft/6,350m about 2,000ft/610m from the top. We roped up for safety and after being out for 5 hours we were back at camp. I, for one, fell exhausted in my tent to rest. Now I have to tell you about Osvaldo. He is one person who I know did not succumb to exhaustion. Osvaldo, a real mountaineer if I have ever met one, put on a heavy pack of waste and gear no longer needed and headed for Plaza de Mulas from Berlin Camp, a descent of 5,000ft/1,525m and 5.5 miles away. He bypassed Nido de Condores and Camp Canada, slept for a short while and then came all the way up to Berlin Camp again for the final carry to Plaza De Mulas, our base camp. If anyone could have summitted that day it would have been Osvaldo. If you are looking for a positive mountainering experience I can give Berg Adventures International my highest recommentation. Check it out!